Just a few small updates. An evaluation has to be performed. This evaluation is basically what enables your child to participate in the program. We were told a few times that Alex’s hearing loss diagnosis was probably enough in itself, but as part of the necessary boilerplate (this is a government-funded program, after all), an evaluation still needs to be done. The evaluation itself is apparently only going to take about an hour or so, and they’ll be looking for other potential issues Alex might be having. Tummy time was mentioned a few times, neck strength, motor skills, that sort of thing. Knock on wood, we’re not too nervous about Alex physically. He feeds well, he sleeps well, he smiles, he makes eye contact, and he’s picking weight up. Our pediatricians haven’t noticed anything at this point either. The next step after the evaluation (and I’m told that we’ll actually do this the same night of the evaluation which may be because Alex’s should be pretty easy) is to formulate a starting plan. That’s probably where we’ll say “speech therapy, Buffalo Hearing and Speech intervention program,” etc. Shannon and I are looking forward to this piece, because that’s going to be the blueprint for Alex’s immediate future. A large component of that is going to be having a specialist go to our house and give us some guidance on how to best interact with Alex. Really looking forward to soaking all of that up! Once the formal evaluation write-up gets to the Early Intervention folks, the plan essentially activates, gets funded, and away we go. I had mixed feelings about the meeting itself – this is still so new and fresh that it was tough to realize that this was real – my kid’s in early intervention. At the same time, it’s somewhat empowering. The coordinator I spoke with was very sweet and supportive, and she emphasized a few times that Shannon and I will be in the driver’s seat. We’re going to have a team of people working toward getting Alex whatever sort of help we can, and we can change the plan as we go along and learn more about our little dude. We’ve got ’em for three years. Another thing that I was happy to learn is that we’re probably less than a month away from getting Alex hearing aids. Now, we still don’t know if Alex has auditory neuropathy or not, which comes into play. If he DOES have it, then it’s likely that hearing aids wouldn’t do anything for him except for make white noise sound louder. However, if he doesn’t, we could expect that Alex would at least be able to hear a little bit more than what he can do now. A recurring vision that I’ve had is that I’m sitting in my chair in our family room, looking at Alex’s back (he’s facing the TV, maybe playing with some toys or his sister). I call his name or make a loud sound and he turns around. That sounds incredible to me right now. 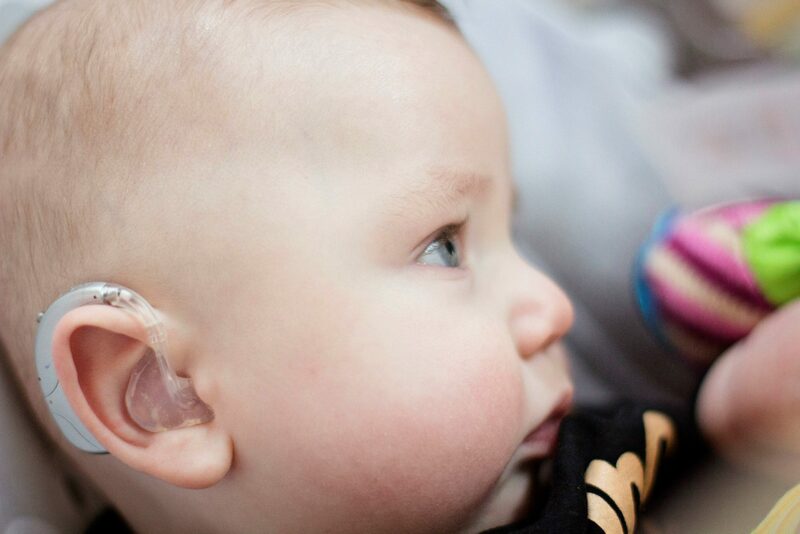 We don’t have any sort of high hopes for the hearing aids, but any possibility that they might be able to help Alex at all feels like major progress. We’ve been diagnosing and testing for what seems like forever. Though it feels like we still don’t have any traction walking down any particular path, it feels good that we’re going to at least start walking. Other notes… the hospital called our ENT and stated that they didn’t want to try to get an MRI performed on Alex until he hits six months. Though that’s no surprise and didn’t feel like any sort of major setback, it’s somewhat disappointing that we won’t know if we have the option of cochlear implants for that period of time. We still don’t know what’s up with the auditory neuropathy. We have another appointment setup with Buffalo Hearing and Speech and we’re somewhat assuming that they’ll perform yet another ABR to look specifically for AN, but who knows. If nothing else, that appointment should be informative so we can learn a bit more about their two programs (one that’s based around using hearing technology to boost listening / speech skills for mainstreaming and one that’s more of an ASL route but uses total communication that would include any hearing capabilities). I’m tempted to write about how the family has been doing in general, which is definitely BETTER, but I’ll save that for a later post. I’ve gotten a few notes from my past few posts, and just wanted to take a stab at clearing the air quickly. At this point, what I’m writing is very emotionally charged. I know that I’m saying dark things, but the reason I’m doing this is to document the journey I’m on and being real about it. I mean no offense to anyone involved in the Deaf community, and I understand their perspective that there’s nothing wrong with them that needs to be fixed, they’re just different. I find that perspective to be very reassuring. I apologize to anyone who takes offense at my visceral reactions to what’s going on with Alex and would hope that they would understand that all rationale is generally out the door when you’re talking about your children, but again – my goal is to document the journey, and that will almost certainly involve change. I want it all here as an honest representation of that journey. I initially thought I would write just a private journal, but decided to publish it in the hopes that, along the way, it might help someone else in some capacity or let our friends and family know what’s going on and how we’re doing. On another note, if I seem gung-ho on cochlear implants at this point, it’s because they represent the ability for myself and Shannon, as parents, to give our child all that we can. We know that it might not work. We know that if it does, it’s not a “cure” for his hearing loss. We’re not squarely on that path yet. Alex’s viability as well as the testing that can be performed to see how well he might take to them will absolutely be major considerations, and we’ve been very happy with what we’ve heard about the Total Communication / ASL Early Intervention route as well. Our happiness or love for our child doesn’t hinge on him getting cochlear implants, just as we know that his love for life and identity aren’t dependent on them (or any other medical device) either. I hope this gives some clarification on where I’m coming from. So far, the story has been written in a pretty bleak way, but that’s because this is all still very fresh for me. Believe me when I say that Shannon and I have had many conversations about how we can’t wait to look back on this period and roll our eyes at ourselves for worrying so much about our beautiful son.